Do you know how to organize absolutely anything? Do you have a basic organization system? If not, then read on! This basic organization process will help you to organize absolutely anything at work (or at home). You’ll be able to organize your work space, desk, and supplies in a few simple steps. And you’ll say buh-bye to office clutter. Don’t miss this basic organization system and learn how to organize absolutely anything at work. You’ll also pick up a few extra tips and ideas, too! Establishing an organization system that you follow every time you declutter and organize an area in your office or at home will make the process easier and much more enjoyable! By following the same steps each time, so you’ll save time and energy, too. Read on to learn how to organize absolutely anything at work and to learn the steps in my basic organization system. When embarking on an organization project, whether large or small, it’s important to experience a quick success that will propel you through the rest of the project. You can experience a quick organizing success by packing up all of the stuff littering the area you’re organizing. I like to round up any empty bins, baskets, and boxes that are lying around and fill them with the clutter and stuff junking up my space. By starting with this step you not only enjoy a quick success, you’re able to focus more clearly on the project at hand because you aren’t staring at piles of clutter. It’s also calming and refreshing to see open space when you look at the area you’re organizing! This is a quick step. Packing up the clutter in your space shouldn’t take more than 10-30 minutes! Now that you’ve experienced a quick organizational success, it’s time to determine the why behind your project and make a plan of attack. What is it that you’re wanting to accomplish in this space? Rearrange and use the space for multiple purposes? Save yourself time by more effectively organizing the items in the space? Your goal may not be listed above, and that’s okay. The point of this step is to have a clear purpose for your organizing project. This will help you to stay focused and avoid falling into the “rabbit hole” of organizing for organization’s sake. To help you plan your organizing project, grab this Project Planner and fill it out with the tasks you need to complete in each step. If your project is big and has lots of tasks, grab a task sheet, too! Now that you have cleared some of the clutter and know the purpose of your organization project, take a discerning look around. Are you using the space in the most efficient way? Could you relocate items that are used more frequently to a more accessible spot? And on the flip side, could you relocate items that are used LESS frequently to a LESS accessible, less convenient spot? Could you be more comfortable in the space if you moved your desk, table, or work space? Now that you can see past the clutter, evaluate your space and determine if there are steps you can take to make the space more efficient, more comfortable, and more enjoyable. If you’re not sure, make some notes, then continue to think about these questions as you use this space over the following week or two. Ideas will come to you as you’re using your newly organized space! Dig in because this step can be challenging, which is why we start with a quick success that will help propel you through this more difficult and time consuming step! Find a comfortable place to work where you can spread out and work for the entirety of this step. To make your project a little easier and a little prettier, here are printable bin labels that you can print and put in page protectors: Organizational Bin Labels. Set a timer for 15-30 minutes and press start, grab one of the bins you filled in step 1, and start sorting. Put any trash, recycling, items to shred, or items to give away in their respective bins. Start a pile of items to return to the space you’re organizing. If you’d like, you can break this pile down into sub-categories. If this feels too overwhelming for you, start with creating one big pile of items to return to the area you’re organizing, then complete a second round of sorting to organize those items into narrower categories. Once your timer goes off, you’re done for the day, unless you have the time and energy for another round or two. If you’ve blocked out the entire day to work on this organizing project, then work for 15 minutes to an hour, take a break, then start again. Continue this process until all of the bins you filled in step one are sorted and decluttered. Whether you’re working in short spurts over several days or knocking this project out in a day or two, it’s important to include breaks so that you don’t burn out and quit in the middle of this project. That will leave you with a bigger mess, more clutter, and serious frustration! Now that all of the items from your space are sorted, it’s time to take a look at each pile and determine what stays and what goes! The first step in decluttering is to throw away, donate, or recycle any extra items in the same category. For example, I don’t need 3 single hole punches in the same size. If there are items in piles that you know you never use, you can declutter those as well. If there isn’t much you decide to declutter, that’s okay. Just pay attention over the next month or so, then revisit the decluttering phase to clear out any items you haven’t used since you completed your organization project. The next step is to put away items you’re keeping in your space. If you don’t have a drawer or something similar to contain them, you’ll want to find containers to keep like items together. When I organized my office, I found containers for my Sharpies (I have A LOT of them), pens, pencils, paper clips, and tools like my stapler, scissors, and hole punches. I also added hanging files to my file drawer to keep all of my business paperwork neat and organized. Now that you’ve sorted, decluttered, put away, and containerized the items in your space (go you! 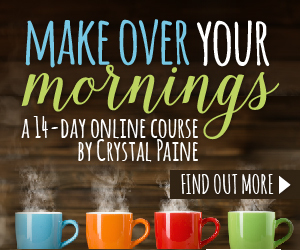 ), you’ll want to spend some time over the next couple of weeks to re-evaluate your space and ensure that it’s set up in a way that works efficiently for you, makes you feel comfortable, and makes it a joy to be in that space! The final piece of this process is to maintain all of your hard work! Take time each day to clear your desk top and work a little decluttering time into your schedule each week. You might also want to schedule big decluttering sessions annually or quarterly. Here are two examples with different spaces to show you how this works with ANY organization project. The first thing I did when tackling my office organization project was round up empty bins and boxes and load them up with all of the clutter and stuff junking up my office. Then I evaluated my space and made sure that I was using it efficiently (step #2). My bookshelves would work better on the opposite side of the room, so I moved them. I wanted a comfortable chair where I could sit and work when I didn’t want to work at my desk, so I added one to the room. My desk was WAY too big for the space, so I replaced it with one that better fit the space. Looking at my ugly printer every day was annoying me, so I relocated it to my office closet where I can use it easily but don’t have to look at it. I needed to better utilize the closet in my office (this room is actually a bedroom); originally I had this space set up as a craft “room,” but I don’t craft as often as I used to, and when I do, I prefer to do it at the kitchen or dining room table. So, I moved most of my craft supplies to the basement and filled a caddy with the most frequently used supplies that I’ll keep in the closet. I rearranged the items and added more office storage items to this space. I also created a charging station in this closet, so that I had a convenient place to charge all of my electronics, but I didn’t have to look at the charging station. I’m still looking for a new location to store my sewing cart. With this plan laid out (and after trying a few different approaches), I started sorting the items in my bins and decluttered them. Then I assigned homes and added containers to keep like items together. I spent the following few weeks paying attention to how my space worked and tweaked things. I moved a few items to a less accessible location when I realized I didn’t use them much. I’m actually still working on this space as I haven’t quite finished making over my office. Each day I clear the top of my desk. Weekly I clean and declutter one area of my office, and I do a full office declutter each quarter. Want to get your office organized and decluttered? 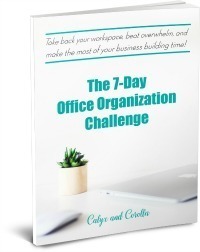 Join the 7-Day Office Organization Challenge! Each day for 7 days, we’ll tackle one office trouble spot, get it decluttered and organized, and create processes (habits & routines) to KEEP it that way! Join the FREE challenge HERE! My baking items were strewn all over the kitchen; I designated one cupboard for baking supplies and relocated all of my supplies to that cupboard. My colander and salad spinner were about as far from the sink as they could be. I moved them closer to the sink since that’s where I use them. Our coffee and tea supplies were taking up a ton of space in the main area of our kitchen, so I created a coffee station on the desk in our kitchen (we never use it as a desk). I put all of our spices together in one drawer. I cleared everything I possibly could off of our island, because that’s our work station. With this plan laid out, I started sorting the items in my bins and decluttered them. Then I assigned homes and added containers to keep like items together. This was especially important in my baking cupboard! I spent the following few weeks paying attention to how my kitchen space worked and tweaked things. I moved my slow cooker to a different cupboard, because I realized I was hauling it from one end of the kitchen to the other to use it on an open counter space. And I also made a few other little tweaks. Each day I clear and wipe down my counters. I also wipe down my cooktop and empty and clean my sink. Once a week I do a deeper clean and a full declutter of the kitchen once a month (since it’s such a frequently used space). And that’s my basic organization system that you can use to organize absolutely anything at work (and at home)! Follow this process, and you’ll find be able to organize your work space, desk, and supplies in a few simple steps. And you’ll say buh-bye to office clutter! If you found today’s post helpful, you might enjoy these related posts. Thanks for joining me today and good luck with your organization projects!